Changed the presentation a little bit. Changed quests so that they start when you click the radios, rather than having to leave the Data menu while they're playing. Added a message from Ulysses for The Reunion, player reads the note to start the quest. Changed radio activation, they now become available at a certain level and broadcast everywhere like vanilla. Changed implementation and script structure for better performance. Updated to reflect changes in Yukichigai Unofficial Patch (YUP) 11.2. Changed script structure for better performance and compatibility. 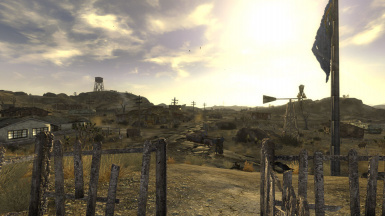 Changed Mysterious Broadcast to enable and play everywhere once player discovers the Mojave Drive-in. Changed radius of Sierra Madre and Happy Trails radios, shorter distance. Added radio management so that they are disabled when playing DLC, similar to Mojave Music Radio and Radio New Vegas. Added functionality so that Black Mountain Radio is disabled in the Sierra Madre. Changed player detection method on quests. Changed radio setting detection method. Fixed not remembering functionality upon reload. Fixed Happy Trails radio not resetting. Fixed Happy Trails quest locking up when receiving it. Changed everything from the ground up, now uses NVSE along with JIP and Lutana plugins. Fixed Gun Runners' Arsenal messages. Added option to activate DLC by discovering the entrances to all the DLC. Added completion requirement to Old World Blues and Lonesome Road. Fixed potential issue where DLC could've activated while playing other DLC.